Who is Cody Wilson, the man behind the 3D printed gun? 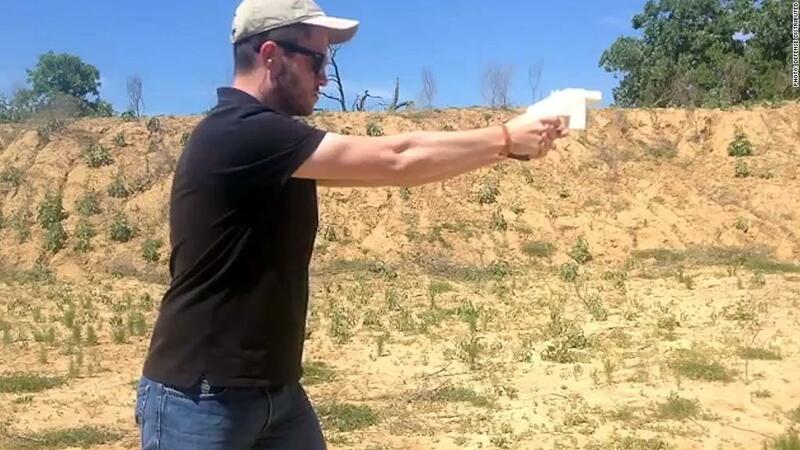 In 2013, at a firing range outside of Austin, Texas, Cody Wilson pulled the trigger on the world's first fully 3D printed gun. Not long after, he posted the blueprint for the weapon to his website, DefCad.com, allowing anyone to download directions to manufacture an untraceable plastic gun at home. The plans were downloaded more than 100,000 times before the government ordered him to take them down. Wilson sued the government in 2015 and a settlement was reached in June that allowed the blueprints for Wilson's gun -- along with several other weapons -- to legally be posted online. Gun safety groups and dozens of states filed lawsuits to stop the plans from becoming downloadable. The night before all of Wilson's blueprints were set to go live online, a federal judge blocked the government from allowing the distribution of 3D printable guns. Wilson's goal is to make his Austin-based nonprofit Defense Distributed a digital hub for do-it-yourself gun-making -- a sort of Wikipedia of weapons manufacturing. Not only can you visit the site to download blueprints to guns, but users will also be able to upload blueprints for guns of their own design -- a feature Wilson hopes will lead to "types of guns that haven't existed before," he says. "If people have an internet resource of some type of encyclopedic scope," he told CNNMoney's Laurie Segall, "it should allow for more innovation in the space." His website is down after the judge's ruling Tuesday. Wilson is the founder of a tech company, although he doesn't describe himself that way. Despite the technical feat of creating the first-ever 3D printed plastic gun and then building a digital community around that invention, he classifies Defense Distributed not as a tech company, but as a "nonprofit defense firm." His customers create accounts on DefCad.com, and then they are free download plans and contribute data to the site. Wilson does not portray himself as a CEO who's trying to build a profitable business and disrupt the way we live. Instead, he identifies as more of a political figure -- an anarchist, fighting against what he views as government censorship. "I'm a radical individualist," Wilson told Segall in 2017. "I don't like the imposition of state controls over human flourishing and creativity, freedom, individuality. And so, the way to oppose these things is to undermine the powers of traditional liberal institutions." According to Wilson, founding Defense Distributed was another way to oppose what he thinks is censorship at the hands of the United States government. By suing the government for violating his First Amendment rights, he shifted the focus of the debate about 3D printed guns away from gun control to a discussion about access to data and information online. "I want people to know that it's legal to publish this information online," he says. "Do public libraries perform background checks on people before they read books? That's just not how speech and publication works." Defense Distributed hasn't been Wilson's only foray into defending freedom of speech online. Last year, as prominent figures in the Alt-Right were being kicked off of Patreon, a fundraising site, he formed a rival platform -- Hatreon. "The site exists with only the promise that you won't be silenced," he told CNN in 2017. "On Hatreon, there's no way your political speech can be deemed unacceptable. There's an unlimited protection of speech." Currently, the Hatreon site is down. But while it was up and running, those registered on the site had raised more than $20,000, according to Wilson. In CNN's 2017 special Divided We Code, he said "The Alt-Right is joining it. They get a lot of the money, the lion's share of the money for now, because they know they can go there and not be censored." Although Wilson acknowledges that allowing all kinds of speech can lead to hateful statements and even violence, he takes no responsibility for the possible outcomes of allowing any kind of speech on his platforms. "Any book is, in the right hands, like a grenade. This can't be controlled and we shouldn't try to control it," he told CNN. "These personalities that use Hatreon ... are at worst trolls, performance artists, provocateurs, vulgarians. At best, they represent through their hyperbole or through their extreme thinking and presentations elements of a political speech that should not be censored." While he says he'll follow the law and draw the line at allowing barred foreign nationals, governments and terrorists from downloading blueprints to 3D printable guns, Wilson's line of thinking on the consequences of allowing any kind of speech also extend to Defense Distributed, despite the fact that the site democratizes the ability to make deadly weapons -- possibly allowing them to get into the wrong hands. For Wilson, it comes down to that one word: democratization. "I don't believe that access to information is ever tremendously negative or a bad thing. I know that people can use information for bad things. But this isn't a justification to what, stop a publisher from speaking," he says. "Is democracy dangerous or not? Can people be trusted or not?"